These days it’s unlikely that any reputable scientist would publicly admit that they believe in ghosts. This wasn’t always the case. Here are seven prominent scientists and inventors who believed in ghoulies and ghosties and things that go bump in the night. Alfred Russel Wallace independently devised the theory of evolution by natural selection. Darwin’s and Wallace’s theories were published simultaneously. At one time Wallace was the most famous biologist in the world. He also attended seances in which he believed mediums were able to communicate with the spirits of the dead. 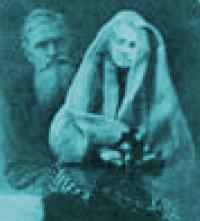 The image on the left is a ‘spirit photo’ which shows Wallace with what he believed was the spirit of his deceased mother. In the days before digital cameras, dishonest photographers could earn good money adding ghostly apparitions resembling people’s dead relatives to photos in the developing room. Nobel Prize winning scientists Marie Curie & Pierre Curie attended seances, some of which were presided over by the Italian medium Eusapia Palladino. They witnessed her apparently levitating tables and communicating with the dead. Seasoned investigators later revealed that Eusapia Palladino was a talented fraudster who used trickery to achieve her effects. At one point in their careers, the Curies speculated about a possible spiritual source for the energy released by radioactive elements. One of the world’s most prolific and successful inventors, Thomas Edison had some curious beliefs, one of which was that he could use technology to communicate with ghosts. In 1920 he confided to a journalist from American Magazine that he had a ‘spirit phone’ in the works. 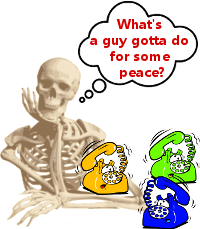 The phone would allow people to talk to the dead. Years later, when no phone appeared, he said it had all been a joke. William Crookes discovered and named the chemical element thallium. He also attended seances and investigated mediums, concluding that they actually did communicate with the dead. 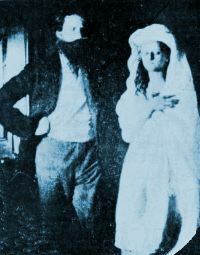 He is pictured in 1874 with what he believed to be a ghost known by the name of Katie King. Katie King would appear at seances under the direction of the teenage medium Florence Cook. And Katie was not just an ethereal presence. Crookes satisfied his scientific curiosity by touching her, taking a cutting of her hair, and measuring her pulse. Oliver Lodge was a physics professor who, in the late 1880s, discovered how to transmit and detect radio waves independently of Heinrich Hertz. Lodge was a member of the Ghost Club, which investigated hauntings. He was also president of the Society for Psychical Research, which investigated the paranormal. In 1890 Lodge and Heinrich Hertz got together to discuss their radio discoveries. Hertz revealed to Lodge that he too was interested in the paranormal, an interest that had arisen from his own personal experiences. Lodge believed his son Raymond, killed in 1915 in World War 1, had communicated with him at seances. 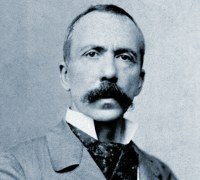 Charles Richet won the 1913 Nobel Prize in Physiology or Medicine for his research into anaphylaxis, the rapid, potentially lethal allergic reaction to triggers such as food and medications. Richet founded the journal Annales des Sciences Psychiques (Annals of Psychic Research) in Paris in 1891 and became president of the British Society for Psychical Research in 1905. An enthusiast for all things paranormal, we owe the word ectoplasm to his vivid imagination. Unlike the ectoplasmic gunk familiar to Ghostbusters fans, Richet didn’t believe ectoplasm came out of ghosts – in fact, unlike the other people on this page, he was quite skeptical about the existence of ghosts. He thought spiritualist mediums produced ectoplasm when they were bringing past events into the present. 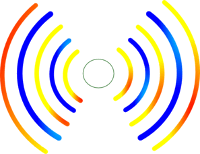 He believed mediums tuned into some form of vibration, which he likened to Heinrich Hertz’s recently discovered radio waves. Richet was fooled by several mediums who were later shown to be fraudsters, such as Linda Gazzera, Eusapia Palladino, and Eva Carrière. Thank you for the article, I found it to be quite interesting and curious in nature. Informed me of things that I had never considered. I started believing in spirits when my grandfather died. I also started getting deja vu after his death.